What Are The Leading Alternatives To Kitchen Cabinets? For those with growing families and a smaller home space, the lack of room within kitchen areas can become a constant source of frustration. Kitchen cabinets can often take up a large amount of room within this limited space, which is why many families are now removing their traditional kitchen cabinetry and replacing it with updated storage. Alternatives to traditional cabinets enhances the look of their kitchen while freeing up room for their young family. 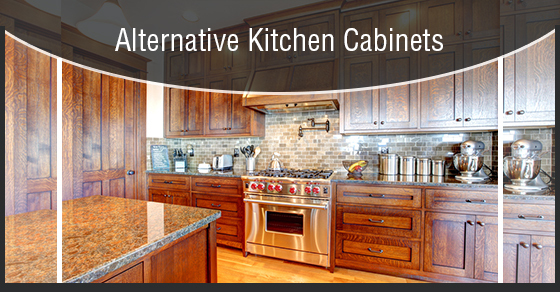 Within this blog, we’ll highlight several of the latest alternatives to kitchen cabinets. Repurposed shipping containers can be used as a stack and set option within an updated kitchen space. Vintage wooden containers can be used to achieve that classical appearance, while presenting a modern alternative to traditional cabinetry. In the past year, these have exploded as a popular option for replacing kitchen islands. With a unique look and ample storage options, the sturdy alternatives are rapidly becoming a loved option. School-style steel lockers can be used to add to any silver industrial kitchen aesthetic. A leading advantage of using older lockers to store food is that tempting candies and sweets can be kept out of reach of young children in a protected space. For those who prefer a minimalist approach to kitchen design, open shelving can be added to any wall space. Shelving allows homeowners to highlight their treasured pieces in an open viewing area while giving them the flexibility to keep their kitchen belongings in convenient places for easier access. Oftentimes kitchens aren’t completely organized and ready for display to visitors, so homeowners might consider adding sliding frosted door covers to their shelving spaces to give them the option of a cover during those days where organization has taken a back seat to cooking. Durable and easy-to-move, filing cabinets can be a great addition to any kitchen space. With a simple coat of paint, those older office filing cabinets can be transformed to blend with any home décor arrangement. Place a cutting board on top of mid-height cabinets and homeowners have the ideal kitchen work space! A fun way to take their look from business to kitchen chic is to paint the sides with chalkboard paint. You can add recipes, grocery lists, and other food-centric items to make the cabinets look at home in your kitchen. That rugged bookcase can still serve a multifunctional purpose around the home. Instead of having the bookcase gather dust in the living room, bring it into the kitchen where it can be used a pantry and utensil storage area. It’s the ideal addition for a homeowner with a large amount of dishware and kitchen equipment to store! Old kitchen cabinets can prevent you from achieving that functional and aesthetically-pleasing kitchen area. Speak to your local renovation experts and discover the range of alternatives to traditional cabinetry!